This page explains how the web site www.carniaholidays.it treats the personal information of those accessing it. All data provided by you will be handled with the sole intention of executing in a correct and complete manner the services requested by you. - sending price lists, catalogues, etc. Data handling shall be carried out thanks to manual and computerized means by the persons (internal and external) in charge of processing your data and by the Carnia Holidays staff who shall use your data to ensure an efficient management of the web site. Carnia Holidays collects access and navigation data related to its websites and servers in order to ensure the functionality of the services and sections requiring user identification. The gathered data shall be used for the technical management of the website and to draw up internal statistics on its functionalities. 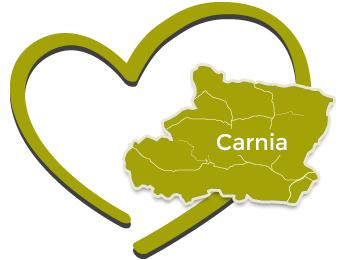 Carnia Holidays uses general statistical data about visitors and other information linked to the website. Data referring to individual visitors shall never be communicated to any other external persons. Any form of data distribution or communication to third parties is excluded (with the exception of those responsible for the services with the purposes stated above). All concerned parties can exercise their rights in compliance with Article 7 of Legislative Decree 196/2003. They can at any moment freely gain access to their personal data and ask for them to be modified or cancelled by sending an e-mail to the following address: info@bbcarnia.it. The information systems and software procedures relied upon to operate this web site acquire personal data as part of their standard functioning; the transmission of such data is an inherent feature of Internet communication protocols. Such information is not collected in order to relate it to identified data subjects, however it might allow user identification per se after being processed and matched with data held by third parties. This data category includes IP addresses and/or the domain names of the computers used by any user connecting with this web site, the URI (Uniform Resource Identifier) addresses of the requested resources, the time of such requests, the method used for submitting a given request to the server, returned file size, a numerical code relating to server response status (successfully performed, error, etc. ), and other parameters related to the user's operating system and computer environment. These data are only used to extract anonymous statistical information on website use as well as to check its functioning; they are erased immediately after being processed. The data might be used to establish liability in case computer crimes are committed against the website. Application software used in this site can contain the "cookie" technology . Cookies are primarily used to facilitate browsing the site. Cookies may provide information about navigation within the site and allow the operation of certain services that require the identification of the location of the person through different pages of the site. Further information about cookies can be found on the websites of the browser. In this site we use technical cookies, functional cookies and Google Analytics cookies. If you want to disable cookies o read further information, follow the links below. The handling of certain types of services and data provided by this website requires your expressed consent. Specific clauses will be clearly stated, and when appropriate, consent will be explicitly asked. This website employs specific security measures to guarantee a safe access to its users and to prevent the risk of information loss or destruction, including accidental. The anti-virus software used in the management of the website is updated daily. Carnia Holidays keeps its anti-virus systems up to date. However, the users are legally required to install and maintain security and virus protection systems. To access the private area of the web site, the users are assigned an identification code and a password. Each password is personal and chosen personally by each user. The password is personal and must be kept confidential. Do you want to rent your house, apartament or room to tourist? Discover how to open a family style accomodation.